Ron Howard has spent his entire life in/around film and television. He's not only done so much, but some of his work is so iconic, it's hard pin down what he's best known for. 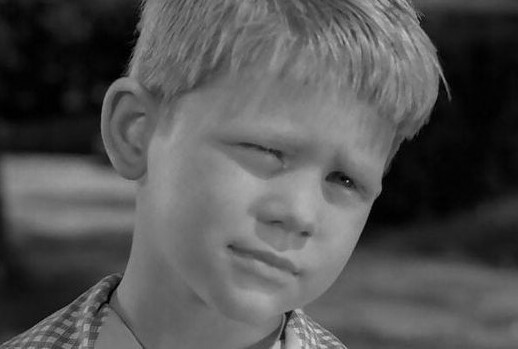 He played Opie on The Andy Griffith Show, Richie Cunningham on Happy Days, and was the narrator on Arrested Development. He directed Splash, Apollo 13, and The DaVinci Code. He was the executive producer on Sports Night, Felicity, and Curious George. You almost can't write a history of late twentieth century film or television and not mention Howard. And he's no stranger to comics either. He appeared in six episodes of Dennis the Menace, he produced the film version of Cowboys & Aliens, and had a brief cameo in The Death and Return of Superman. But one of his first gigs was in a live-action version of Crockett Johnson's comic strip Barnaby for General Electric Theater, hosted by Ronald Reagan. The story was actually called "Mr. O'Malley" and featured Bert Lahr in title role there. My hope in working on this column was to be able to present video of the 1959 episode, but it does not appear to be online anywhere. In fact, despite the episode featuring both Howard and Lahr (as well as some voice work of Mel Blanc), I can't seem to find any visuals at all associated with it! The photo of young Howard I'm running with this post is from his appearance on The Twilight Zone that same year. I was this kid who really wanted a dog for Christmas. My dad was sort of a workaholic, and not paying a whole lot of attention, and sort of not interested in having a dog. And I was disappointed about that. I was kind of lonely and I wished, I made a wish. "I wish I may, I wish I might get the wish I wish tonight" or something like that. I remember this scene looking up. And all of a sudden, Bert Lahr shows up and, in his Bert Lahr voice, saying "I'm your fairy godfather." And he tries like crazy to muster up a dog with his hat, and he can't. He had a little, sort of a Tinkerbell character, and... oh, my God, who's the famous voice-over guy from Warners? He did all the great characters... Mel Blanc did the voice. So I remember Mel Blanc over here on the side, you know, doing the character, with a microphone. And he would also do some of the Warner Brothers characters for me... And at the end of the day, somehow you know, Mr. O'Malley could never figure out how to get me a dog, I don't think. But my father gets the message and I get a dog, and I think Mr. O'Malley did it. During the closing segment, evidently Reagan ad libbed a bit giving special thanks to little Ronnie Howard for doing such a great job for such a small child. Producer Sheldon Leonard heard that, agreed, and promptly called Howard's agent to cast him in The Andy Griffith Show. The rest, as they say, is history. Proof that Mr. O'Malley works in strange and mysterious ways.